Peta Long Loop Scissors have an extended loop that accommodates all fingers, which provides superior comfort, control, and cutting strength. Plus these scissors conveniently reopen on their own after the cutting pressure has been released, thanks to a spring-action mechanism. Choose Blue for right-handed users or Green for left-handed users. A blade guard is supplied for safe storage when not in use. 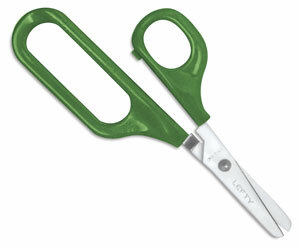 Peta Long Loop Scissors measure 6½" long overall. The stainless steel blades have kid-friendly rounded tips. Peta (which stands for Practical, Ergonomic & Therapeutic Aids) is a UK-based company committed to making products that meet the special needs of children and adults with physical disabilities. ™ Peta is a trademark.